Kathy Casey could probably whip up a book about edible shoelaces, and it would look gorgeous and they would taste d'lish. Without a lot of fanfare, she's built a formidable empire of food: Kathy Casey Food Studios (and Liquid Kitchen) in Ballard, consulting gigs, recipe development, cocktail development, a series of books. Her shop at the airport (Food t' Go Go) offers the tastiest choices for in-flight noshing. She had a stall at the Market that didn't quite pan out; she closed it and moved on. Ditto an ahead-of-its-time café on Ballard Avenue. She's one of the few chefs in Seattle (T-Doug, Ethan) who are a brand unto themselves. And her latest effort is this: a delightful little book about the most mundane of American concotions: deviled eggs. So the first rule: never use super-fresh eggs; they won't peel properly. Cook your eggs a dozen at a time, in a single layer. Cover with cold water, bring to a boil over medium-high heat. Immediately remove from heat, cover, and let stand 15 minutes. Shock with cold water or ice to cool. Refrigerate until you're ready to proceed. Peel under a slow stream of running water. Now you're ready for the complicated stuff. The book has 50 recipes, go to it! Thai Curry-Spiced Deviled Eggs with Shrimp? 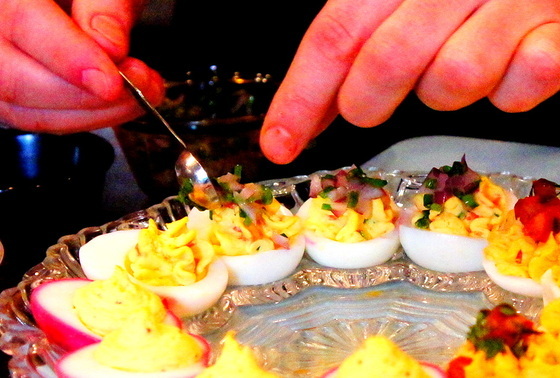 Bloody Mary Deviled Eggs? Crab Louis Deviled Eggs? Yes to all, I say. Buy the book here. You'll need a pastry bag with a fluted tip to pipe the curlicues, or you can just plop the filling down with a spoon, up to you. UPDATES: An excerpt from the book is in the Seattle Times (Friday, March 22nd). And down in Portland, by the way, the Southeast Wine Collective offers a unique tasting that matches wines from the collective's four producers with various locally sourced garnishes atop, yes, deviled eggs. This page contains a single entry by Cornichon published on March 21, 2013 4:00 PM. Culinary news roundup was the previous entry in this blog. A rose is a rose is a rose is the next entry in this blog.